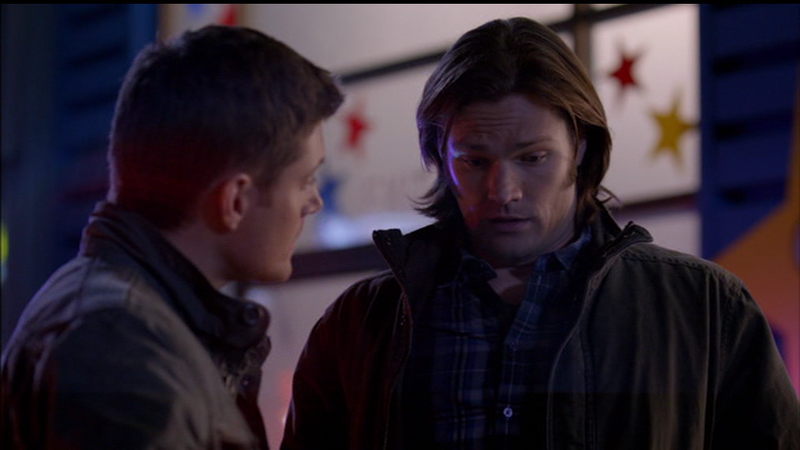 Just to make my life more interesting, Sam got not one but two new blue plaid shirts in the same episode. This one is very similar to his Blue/Grey Horizontal Plaid introduced in S3, but it appears to be darker with a bold stripe of black or dark grey running through it. It also does up with buttons, not snaps. In Plucky Pennywhistle’s Magical Menagerie (7x14), Sam wears this shirt when he and Dean go back to Plucky’s after closing to talk to the janitor, only to discover that he died in a suspicious ball pit accident. I just want to let you know your seasonally increasing exasperation with Sam's endless blue plaid is hilariously entertaining to witness! I'm having a great time reading all these posts (and wow, I wasn't aware he really had THAT MANY blue plaid shirts. At some point I guess I assumed they must be repeating more often that they do). Seriously though! SAM! I mean, on the one hand, I've gotten very good at being able to identify the differences between similar paid shirts, on the other hand - there's not THAT much room in the Impala, how many blue plaid shirts does one man need!? !